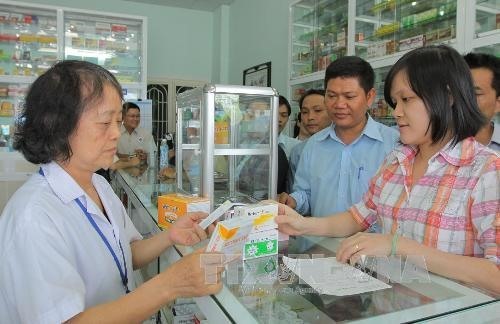 The use of made-in-Vietnam medicines at provincial-level hospitals has risen to 35.4 per cent since the Ministry of Health initiated an ongoing project named “Vietnamese people give priority to using made-in-Vietnam medicines” in 2012. The ratio was over 33 per cent before the project began. Deputy Minister Trương Quốc Cường said the project was designed to help national medicine develop sustainably in the near future. A report from the ministry said the amount of people using made-in-Vietnam medicines at district-level hospitals was up from 61.5 per cent to 69.4 per cent. The percentage in some provinces reached over 80 per cent, including Ninh Thuận, Phú Yên, Lai Châu, Lâm Đồng and Long An. The report also pointed out that 10 out of 12 vaccines supplied under the National Expanded Programme on Immunisation for Children are made in Vietnam. Vietnam now has 163 factories manufacturing medicines that meet Good Manufacturing Practices of the World Health Organisation, the report said. Trần Viết Tiệp, a doctor from the Vietnam – Switzerland Hospital in the northeastern province of Quảng Ninh, said the factories had initially established a network of distribution of their medicines in every province and city throughout the country. The price of made-in-Vietnam medicines was at least 30 per cent lower compared to imported medicines, providing a competitive advantage over imported ones, he said. A representative of a major domestic drug firm said his company always prioritised selecting qualified domestic materials for manufacture. The major materials include Polyscias fruticosa, Cynara scolymus, Glinus oppositifolius and Ipomoea cairica. The ongoing project targets the number of people using made-in-Vietnam medicines at provincial-level hospitals reaching 50 per cent, and district-level reaching 75 per cent, by 2020. To do that, some current shortcomings have to be overcome, said Nguyễn Tất Đạt, deputy head of the ministry’s Drug Administration of Vietnam. The shortcomings include a lack of specialty drugs and suitable marketing campaigns to introduce domestic medicines to users. Therefore, the ministry was encouraging domestic drug firms to boost co-operation as well as conduct in-depth research so that they could manufacture more specialty drugs to serve demand of patients in the future, he said. Currently, the specialty drugs we use were mainly imported, he said. The ministry had also launched a range of programmes to raise public awareness of made-in-Vietnam medicines. For example, a programme named “The way for made-in-Vietnam medicines” introduced domestic medicines via television, radio, newspaper and internet campaigns. Additionally, Deputy Minister Cường said all hospitals were asked to encourage their doctors to prioritise made-in-Vietnam medicines instead of imported medicines when providing prescriptions. Domestic medicine producers should constantly improve the quality of their products to win the loyalty of customers, he said.